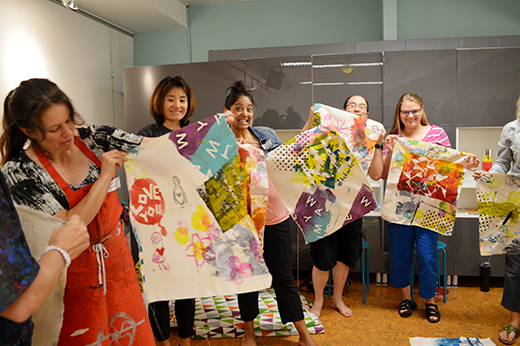 In July we had a full house for the last Art Fundamentals workshop of the year, Collective Creativity: Printed Explorations on Cloth. Our guest artist Colette Lisoway took the group on a multi-layered printmaking adventure to create what she called an "artwork onion". At the beginning of the session, participants got to know each other as they played one of our favourite icebreaker games, Mingle Bingo. 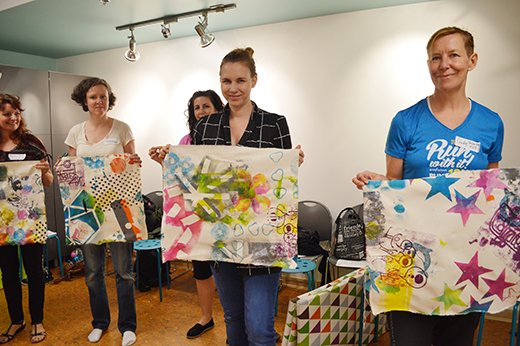 The winner of the game received a Creativity Kit as a prize, a special canvas bag with watercolour pencil crayons. 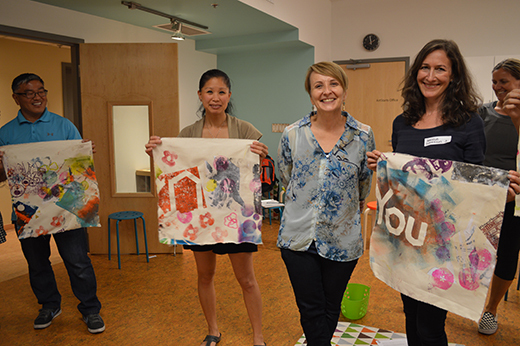 Colette welcomed the group in the ArtStarts Lab space with a large immaculate cotton canvas on the floor and a table full of materials including vegetables, rollers, silkscreens, spatulas, bits and pieces, and inks that the artist mixed herself for a beautiful palette. This was an invitation to discover various techniques from a process-based approach and in a collaborative environment where the notion of collective creativity defined the group dynamic. 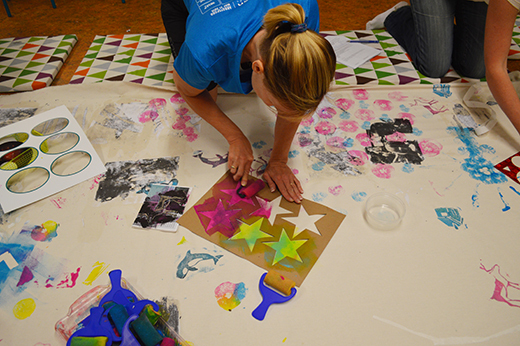 "We will explore one technique at a time and there is not right or wrong here," Colette emphasized as she prepared the materials for the first demonstration. "This piece is not mine, it is ours!" The first technique Colette presented is called image transfer. 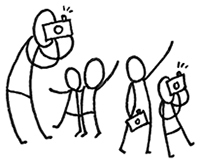 She handed out laser copies with photographs of young people engaged in learning through the arts, a theme that connected all participants. The artist demonstrated how to transfer regular black and white copies as mirrored images that can be printed on canvas using an acrylic gel medium. 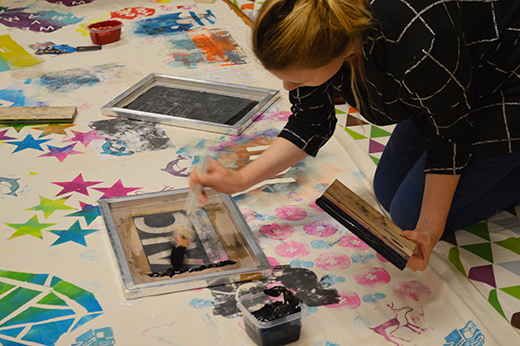 Printmaking techniques require experimentation and there is a big element of trial and error that takes place when engaging in this art form. Some of the copies didn't transfer as expected and some of the paper initially adhered to the fabric. 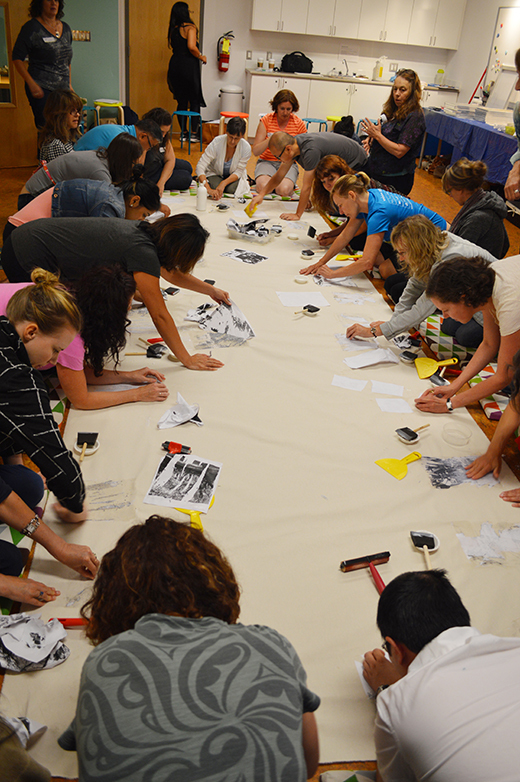 This experience presented an opportunity to see how each participant had a different outcome and embraced "imperfection" or "happy accidents"—as it would happen in the classroom with students. 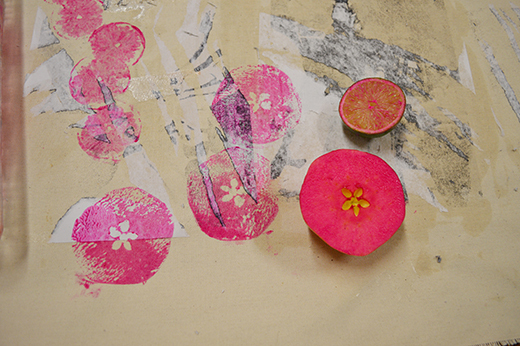 Apples, onions, lemons, limes and peppers were the next printmaking tools presented, along with foam rollers and inks. Colette explained that when printing with fruits and vegetables, "less is more" and she suggested this would be an important consideration when using this technique with young people. When inking vegetables with the rollers, using less ink would produce better and more detailed results. 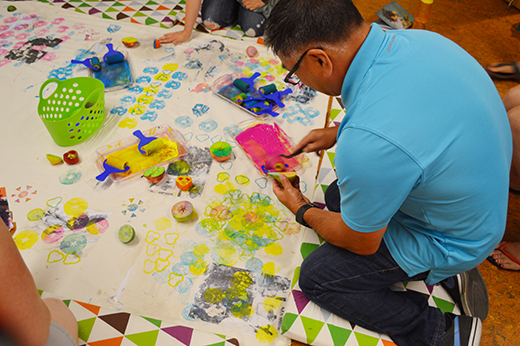 Participants were able to prove this for themselves and started to create interesting patterns and layers by repeating and juxtaposing their prints. The once pristine canvas started to become a celebration of colour and collaboration. At that point, the artist introduced a technique called resists, where masking tape, random flat pieces or cut-outs shapes serve as objects that block the ink from leaving a mark on the canvas. The final technique Colette presented is called screen printing. On top of having an assortment of silkscreens prepared for the session with some fun graphics representing ArtStarts, the artist also distributed a valuable handout that includes the materials needed for each technique she demonstrated, suppliers, quotes and even instructions on how to stretch a canvas. 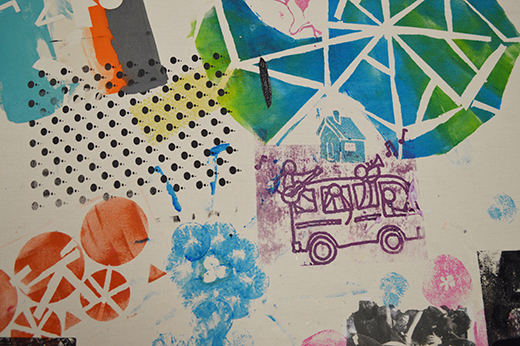 The group benefited from testing, experimenting, working on each other's previous marks and trying a great assortment of printmaking techniques that not only became accessible, but also demonstrated the potential to be a powerful tool to be used in the classroom with kids that might otherwise feel excluded. 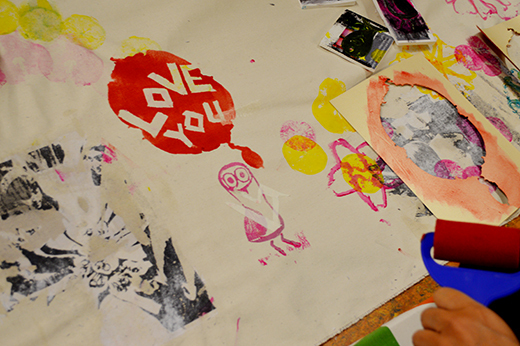 This type of collaborative work encourages new relationships, invites participants to move about and around to connect with other people and also presents an invaluable opportunity for kids to perceive that the work they are creating is about us not me, as the artist expressed. 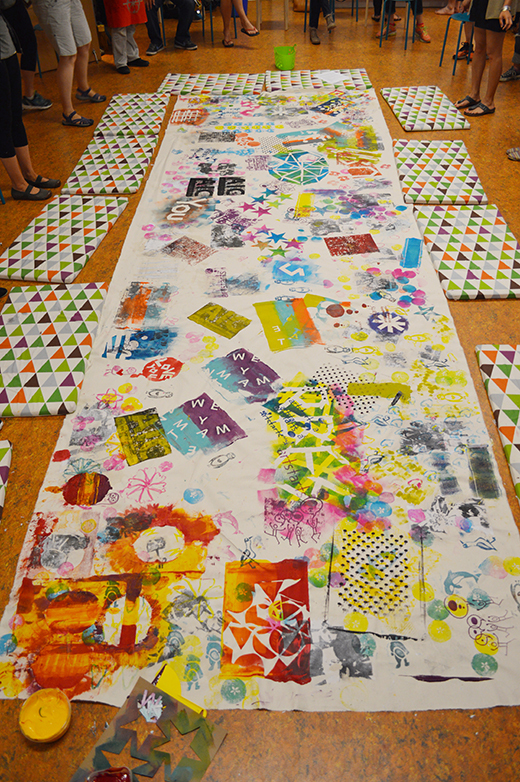 At the end of the session, participants were invited to cut the large canvas into pieces and at the count of three Colette exclaimed, "Let it rip!" This was a very exciting moment, when the large-scale collective creation was torn into individual pieces that recounted the fascinating dance of prints and colour that everybody was part of. "This experience left me feeling more confident to explore art on my own and inspired my teacher-brain with all kinds of activities — quick and long haul — to attempt with students. I feel wealthy having spent the day at ArtStarts!" "As an educator I value the chance to infuse my techniques with art of all kinds." "I learnt so many different art techniques that I would never have thought of using before in the classroom." 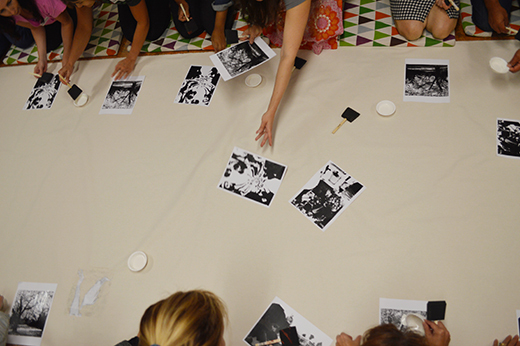 "I would like to incorporate more printmaking into my practice. It is simple yet can be used in so many ways." "I thought the artist was awesome. I liked how you don't need to be an artist to do the activities." "Colette's method of a group project going from no ownership to moving around the canvas working on many areas, then ripping it and taking home a piece was so clever." "I love Art Fundamentals. I always come out inspired." "What resonated with me was the importance of art in life! I enjoy watching and participating with artistic passionate people." 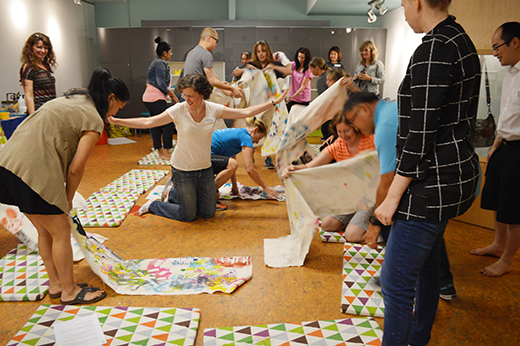 We can't think of a better way to wrap up a year of fascinating Art Fundamentals workshops. Thanks to Colette for her generosity in making accessible all these printmaking techniques that we are sure participants will be using in their classrooms to inspire young people. 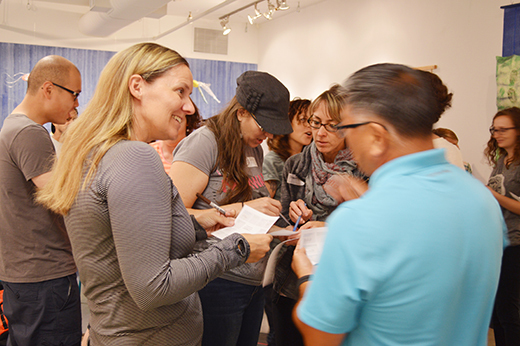 In the next few weeks, we'll be announcing information about our Pro-D Day for Teachers on Friday, October 23, 2015 at the ArtStarts Gallery, as well as a new workshop series for artists who are interested in working with young people in schools. Stay tuned for details!